On my last trip to Vancouver, I was able to squeeze in some catch up time with my girlfriend Lucy. 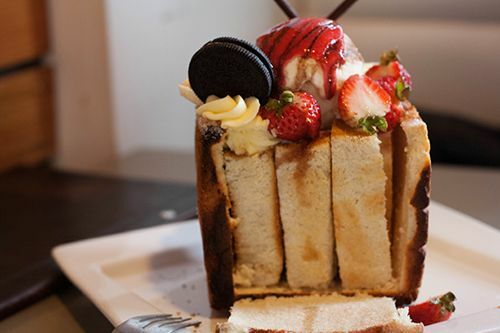 I had previously seen these desserts called 'toast boxes' and was pretty intrigued with the way they looked. And since Edmonton does't do anything remotely familiar, I took the chance to visit What8ver Cafe (how are you even supposed to say that?!) in Richmond to see what the toast box was all about. 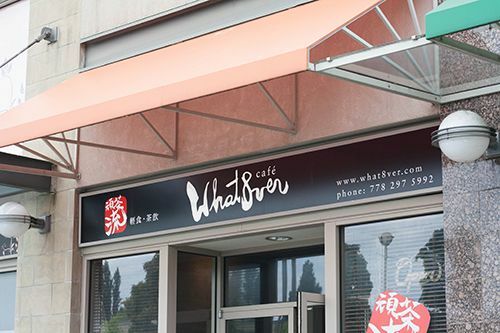 Located in a strip mall amidst an area full of restaurants and other dining establishments, What8ver Cafe is little place serving up bubble tea and Taiwanese snacks from the afternoon into the late hours of the night. The interior is small and intimate, typical of your usual bubble tea establishments. Sitting down at the cafe, we perused the menu, only to find out that the toast box isn't on the menu! I asked the server about the item, and apparently it's an off menu item and actually quite popular - maybe it should make its way onto the menu? With that aside, the toast box comes in three different variations: strawberry, vanilla or matcha green tea. Essentially, the toast box is half a loaf of bread with the middle cut out into 9 strips. 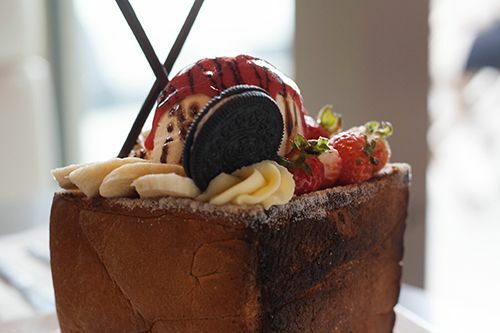 The bread is drizzled with honey and sugar, reassembled into box form, is toasted, and then topped with your choice of ice cream and toppings related to the flavour that you choose. 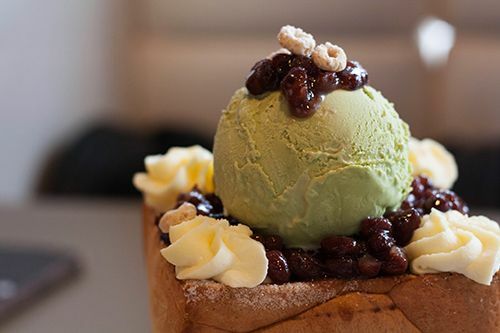 Lucy ordered the green tea version, in which the ice cream was served with red bean, custard and decorated with cheerios. I ordered the vanilla version for myself, which came with strawberries, bananas, custard, an oreo, pocky sticks, and was lightly drizzled with chocolate syrup. I'd have to say this is probably the most unique dessert I've ever tried, and apparently it's really popular over in Taiwan. My toast box was actually a little burnt on the outside, meaning it was over baked and the bread was quite hard and dry. It was basically impossible to eat the outer "box", but the strips on the interior were lightly sweetened and much softer. The ice cream and custard added just the right amount of sweetness, making it a pretty delicious afternoon snack. Having had the toast box experience, it's probably not something I would do again. I'd say eating it is more for the novelty experience - which seems to be working for What8ver Cafe, because they get long lines on the weekends with patrons hoping to try it out. The item itself does take a while to prepare, so be ready to sit and wait for yours. Do keep in mind that this toast box is a massive amount of carbs - I was stuffed for hours, so time your visit right. If you're looking to have this for dessert, bring a buddy to share the experience with! Andrea, these are so unique! I've never seen anything like them. They're so pretty. HaHaHa Thanks for featuring them. THey look like they would fill a person up. I can only imagine the calories. Great review and have a great weekend. Great post, its so sweet!! You make food look amazing with your pictures!! Toast box? haha. I don't see that catching on in Edmonton. Weird.